You cannot over-communicate when you are asking your organization to change. 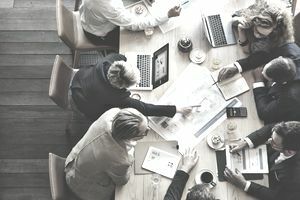 Every successful executive who has led a successful change management effort expresses the need for over-communicating during a change experience and makes this statement in retrospect. No organization exists in which employees are completely happy with communication. Communication is one of the toughest issues in organizations. It is an area that is most frequently complained about by employees during organizational change and daily operations. The reason? Effective communication requires four components that are interworking perfectly to create shared meaning, a favorite definition of communication. The individual sending the message must present the message clearly and in detail, and radiate integrity and authenticity. The person receiving the message must decide to listen, ask questions for clarity, and trust the sender of the message. The delivery method chosen must suit the circumstances and the needs of both the sender and the receiver. The content of the message has to resonate and connect on some level with the already-held beliefs of the receiver. It must contain the information that the employee wants to hear. It must answer the employee's most cherished and cared about questions. With all of this going on in communication, it’s a wonder that organizations ever do it well. Fortunately, change management practitioners have provided a broad range of suggestions about how to communicate well during any organizational changes. Develop a written communication plan to ensure that all of the following occur within your change management process. Communicate consistently, frequently, and through multiple channels, including speaking, writing, video, training, focus groups, bulletin boards, intranets, and more about the change. Communicate all that is known about the changes, as quickly as the information is available. Make clear that your bias is toward instant communication, so some of the details may change at a later date. Tell people that your other choice is to hold all communication until you are positive about the decisions, goals, and progress, which is disastrous in effective change management. Provide significant amounts of time for people to ask questions, request clarification, and provide input. If you've ever been part of a scenario in which a leader presented changes to a large group via overhead transparencies and then fled, you know what bad news this is for change integration. People must feel involved in the change. Involvement creates commitment—nothing else is as significant during a change process. Clearly communicate the vision, the mission, and the objectives of the change management effort. Help people to understand how these changes will affect them personally. If you don’t help with this process, people will make up their own stories, usually more negative than the truth. Recognize that true communication is a conversation. It is two-way, and real discussion must result. It cannot be just a presentation. The change leaders or sponsors need to spend time conversing one-on-one or in small groups with the people who are expected to make the changes. Provide answers to questions only if you know the answer. Leaders destroy their credibility when they provide incorrect information or appear to stumble or back-peddle when providing an answer. It is much better to say you don’t know and that you will try to find out. Leaders need to listen. Avoid defensiveness, excuse-making, and answers that are given too quickly. Act with thoughtfulness. Make leaders and change sponsors available, daily when possible, to mingle with others in the workplace. Hold interactive workshops and forums in which all employees can explore the changes together while learning more. Use training as a form of interactive communication and as an opportunity for people to safely explore new behaviors and ideas about change and change management. All levels of the organization must participate in the same sessions. Communication should be proactive. If the rumor mill is already in action, the organization has waited too long to communicate. Provide opportunities for people to network with each other, both formally and informally, to share ideas about change and change management. Publicly review the measurements that are in place to chart progress in the change management and change efforts. Publicize rewards and recognition for positive approaches and accomplishments in the changes and change management. Celebrate each small win publicly.